The Good: The visuals were truly done masterfully. The story line(s) were very interesting. Pi's numerous ways of survival will keep you watching and wondering how he actually deals with being shipwrecked at sea with a tiger. Also the ending is superb given that it allows you to think/believe what you want. The Bad: Some people may be turned off by some of the religious references of the movie. 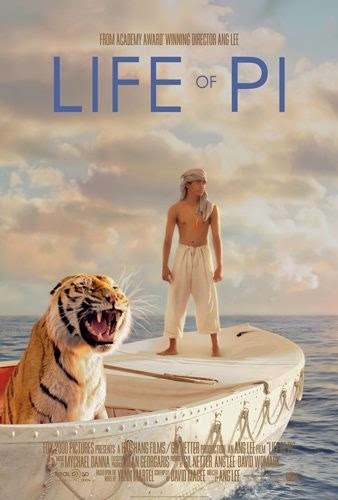 (even though it's not that type of movie) Average movie goers may also become slightly impatient with Pi's struggles with the Tiger in the boat. The Reason: I really regret letting my doubts prevent me from going to the theaters to see this in 3D. Watching it on TV, even as a blue-ray, doesn't do it justice at all. While I thought this was going to be some Tom Hanks "Castaway" meets Noah's Ark, it wasn't what I expected at all. While this isn't a religious movie seeking to convert people to religion, it's a story about a boy's journey in and out of spirituality...but it doesn't end there. The movie does something that very few movies have done well which is basically leave the ending up to the viewer. You get to decide and make a choice at the end of the movie which I think makes this movie that much more special. Definitely worth a rental.